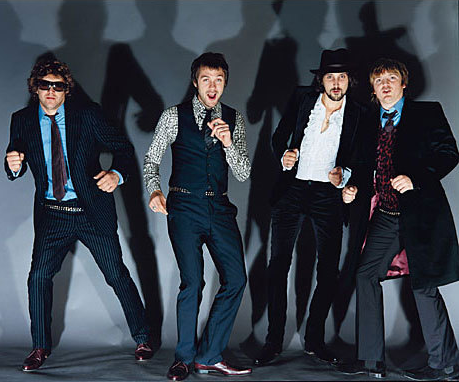 [Listen] Kasabian - "Pistols At Dawn"
More Kasabian is always going to be welcomed with open arms on my part and I'd like to thing some SKoA readers feel exactly the same. This track is the B-Side to the highly infectious "Days Are Forgotten" and it's a slow burner of a track with some highly funky fuzzy bass-lines contrasting to the loose drum beats which remind me of some Patrick Carney Black Keys beats. Just me? The mid song solo and Arabic vibe is a nice touch too. The track is a different side of the spectrum in many ways from the lead single(s) but after hearing album title track "Velociraptor!" live at Hurricane Fest last month, I'm more than eager to get my hands on the full album! This album is going to be a goodie. I cannot wait for it to seap into my ears! Thanks to our good friends at Antiquiet for the heads up on this. Anyone else going to be buying a ticket tomorrow for their newly announced UK tour? See you at the Manchester date if you are!